Learn the basics of building a Batch client in Node.js using Azure Batch Node.js SDK. We take a step by step approach of understanding a scenario for a batch application and then setting it up using a Node.js client. This article assumes that you have a working knowledge of Node.js and familiarity with Linux. It also assumes that you have an Azure account setup with access rights to create Batch and Storage services. We recommend reading Azure Batch Technical Overview before you go through the steps outlined this article. Let us understand the batch workflow scenario. We have a simple script written in Python that downloads all csv files from an Azure Blob storage container and converts them to JSON. To process multiple storage account containers in parallel, we can deploy the script as an Azure Batch job. The following diagram depicts how we can scale the Python script using Azure Batch and a Node.js client. The node.js client deploys a batch job with a preparation task (explained in detail later) and a set of tasks depending on the number of containers in the storage account. You can download the scripts from the GitHub repository. The Node.js client in the link specified does not contain specific code to be deployed as an Azure function app. You can refer to the following links for instructions to create one. You can install Azure Batch SDK for Node.js using the npm install command. This command installs the latest version of azure-batch node SDK. In an Azure Function app, you can go to "Kudu Console" in the Azure function's Settings tab to run the npm install commands. In this case to install Azure Batch SDK for Node.js. You can create it from the Azure portal or from command line (Powershell /Azure cli). Following are the commands to create one through Azure CLI. az group create -n "<resource-group-name>" -l "<location>"
Next, create an Azure Batch account. az batch account create -l "<location>" -g "<resource-group-name>" -n "<batch-account-name>"
Each Batch account has its corresponding access keys. These keys are needed to create further resources in Azure batch account. A good practice for production environment is to use Azure Key Vault to store these keys. You can then create a Service principal for the application. Using this service principal the application can create an OAuth token to access keys from the key vault. az batch account keys list -g "<resource-group-name>" -n "<batch-account-name>"
Copy and store the key to be used in the subsequent steps. Following code snippet first imports the azure-batch Node.js module and then creates a Batch Service client. You need to first create a SharedKeyCredentials object with the Batch account key copied from the previous step. An Azure Batch pool consists of multiple VMs (also known as Batch Nodes). Azure Batch service deploys the tasks on these nodes and manages them. You can define the following configuration parameters for your pool. The size and number of Virtual Machine nodes largely depend on the number of tasks you want to run in parallel and also the task itself. We recommend testing to determine the ideal number and size. The following code snippet creates the configuration parameter objects. For the list of Linux VM images available for Azure Batch and their SKU IDs, see List of virtual machine images. Once the pool configuration is defined, you can create the Azure Batch pool. The Batch pool command creates Azure Virtual Machine nodes and prepares them to be ready to receive tasks to execute. Each pool should have a unique ID for reference in subsequent steps. The following code snippet creates an Azure Batch pool. You can check the status of the pool created and ensure that the state is in "active" before going ahead with submission of a Job to that pool. Following is a sample result object returned by the pool.get function. 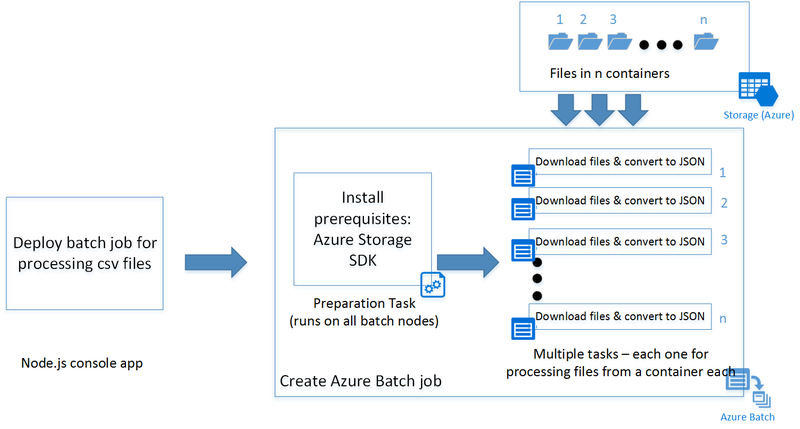 An Azure Batch job is a logical group of similar tasks. In our scenario, it is "Process csv to JSON." Each task here could be processing csv files present in each Azure Storage container. These tasks would run in parallel and deployed across multiple nodes, orchestrated by the Azure Batch service. You can use the maxTasksPerNode property to specify maximum number of tasks that can run concurrently on a single node. The VM nodes created are blank Ubuntu nodes. Often, you need to install a set of programs as prerequisites. Typically, for Linux nodes you can have a shell script that installs the prerequisites before the actual tasks run. However it could be any programmable executable. The shell script in this example installs Python-pip and the Azure Storage SDK for Python. You can upload the script on an Azure Storage Account and generate a SAS URI to access the script. This process can also be automated using the Azure Storage Node.js SDK. A preparation task for a job runs only on the VM nodes where the specific task needs to run. If you want prerequisites to be installed on all nodes irrespective of the tasks that run on it, you can use the startTask property while adding a pool. You can use the following preparation task definition for reference. runElevated: Set it to true if elevated privileges are needed to run the task. If there are no prerequisites to be installed for your tasks to run, you can skip the preparation tasks. Following code creates a job with display name "process csv files." Now that our process csv job is created, let us create tasks for that job. Assuming we have four containers, we have to create four tasks, one for each container. Assuming we have four containers "con1", "con2", "con3","con4" following code shows submitting for tasks to the Azure batch job "process csv" we created earlier. The code adds multiple tasks to the pool. And each of the tasks is executed on a node in the pool of VMs created. If the number of tasks exceeds the number of VMs in a pool or the maxTasksPerNode property, the tasks wait until a node is made available. This orchestration is handled by Azure Batch automatically. The portal has detailed views on the tasks and job statuses. You can also use the list and get functions in the Azure Node SDK. Details are provided in the documentation link. Review the Overview of Azure Batch features article, which we recommend if you're new to the service. See the Batch Node.js reference to explore the Batch API.